Laurie: I heard they’re having a party for you this Friday? Bob: Yep. I have been working here for 46 years, and it’s finally time for me to retire. Laurie: That’s great! What are you going to do? Bob: I’ve always wanted to travel around the world, so I’m heading out on Monday for Europe. Laurie: Wow! Do you have any money saved? Bob: Yep. Every month, I’ve put money into a savings account, and there’s about a million dollars in there now. Laurie: Wow! That’s quite a nest egg! Bob: Proves that hard work pays off. 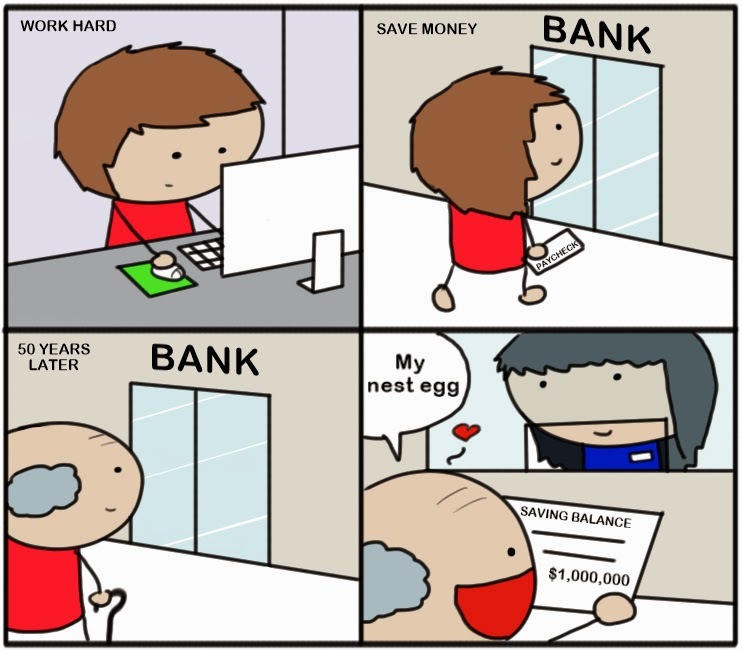 Meaning: A “nest egg” is a sum of money saved for the future. It usually refers to a very large amount saved over a long period of time that is intended for a large expense (retirement, a child’s college education, purchasing property, etc.) rather than a smaller savings.